David Allen has a massive following with his “Getting Things Done” methodology for managing todo items. While it incorporates many good ideas, it’s troubling to see people expending a ton of energy to follow his system to the letter and wasting time wrangling their todo items into the "single trusted system" that he advocates. 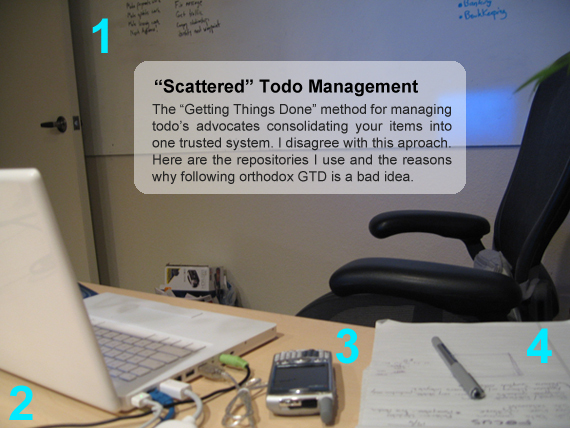 If it feels like you are contorting yourself for the sake of following the orthodox GTD methodology, consider using a "scattered" approach like this one. I completed GTD a year ago and took lessons from it but ended up with a homegrown approach that involves the above four repositories, each with its own function. I have been using this loose system now for the five months we’ve been running our startup and it has greatly simplified life and given me the "mind like water" state that David Allen proposes is achievable via GTD. Whiteboard – Whiteboards are collaborative tools that are good for brainstorming with others but they also make a perfect place to broadcast the current focus of each player on the team. This is consistent with Allistair Cockburn’s concept of the "" and serves as a single place where people can go to understand the current direction and focus of the team. I recommend the "dot size priority trick" for expressing priority of important items. Focus items should be established with input from each player and reviewed periodically to ensure they are not a mandate but rather an agreement. Ticket System – We use Trac extensively as our main hub for tracking tasks. Trac is the authoritative, multi-user system for all things important to your company. It integrates tightly with Subversion and there is a useful script that lets you close out tickets in Trac by entering "fixed #123" in the notes field as you commit files from SVN. We use Trac not only for development but for all facets of the business. We run Trac and Subversion over SSL and have both handled by the .htaccess for authentication. Both Trac and SVN can be driven by LDAP users. We currently use Skype for our office phone and record all important calls using Audio Hijack and then store the audio files in SVN. We also scan all critical business documents and put them in source control. Using a ticketing system gives you accountability and reporting so you know that nothing slips through the cracks and have a a way to see a "balance sheet" of the state of the tasks at any time. PDA – I have a Treo 650 and I use the Palm OS built-in todo list as "swap space" as I’m out and about thinking of new things that need to be done. If the todo is trivial and I can knock out in five minutes when I get back, I’ll do it and check it off without ever entering it into Trac. Otherwise, items get moved off the Treo and turned into Trac tickets once a day. I use Missing Sync and Bluetooth to synchronize everything in my Treo with my Macbook. The todos show up in iCal and you get a full backup of all the data in your PDA so you’re not hosed when it decides to take a swim. Legal Pad – Having a scratch pad on your desk is key. It’s the most frictionless way to take notes throughout the day and not give any thought to processing them into meaningful or actionable tasks. You are purely capturing the raw ideas as they occur in an unstructured (and ideally visual) fashion and minimizing the distraction from whatever it is you’re engaged in at the time. Mind mapping is a great technique to use with physical note taking but again, it’s worthless if you find yourself contorting your behavior just for the sake of using mind maps. Notes on the legal pad should be reviewed periodically and converted to either todo’s in the PDA or in the ticket system. Nothing against GTD – it works for a lot of people and I’ve heard great things about Kinkless GTD. We should expect Omnifocus to be another solid app to come from the Omni guys. The point to consider though is that GTD has become a veritable religion when it should be thought of as a best practices framework of behaviors from which you develop your own system. Learn it but then synthesize it, chop it up and take the aspects you like piecemeal from it and other systems to create your own style. In the end it’s not how closely you can conform to orthodox GTD, it’s about how much you can accomplish while reducing stress and elimating the "open loops". I moderated a discussion yesterday on project management with Trac at the first ever Barcamp in Phoenix. If we get the video capture from that session, I’ll post it here in the comment field. I find your blog rather interesting. Small question about “moved off the Treo and turned into Trac tickets”: Did you hack a script for that from scratch or is there something available to use? Wow, thatÂ’s a really clever way of tinhikng about it! Have you even read David Allen? He advocates a single trusted system that is comprised of as many collection buckets as you need, and this single system can be made up of many components as you need (i.e., Palm plus Palm Desktop plus support files, etc.). You don't have multiple "systems" — you have multiple collection points and components of a system, which David Allen also has (he used to have a Treo, now BlackBerry, Notetaker wallet, laptop, legal pads, Palm Desktop, voice recorder, corporate contact relationship management system, etc.). Dude I don't like your tone. This post is 11 years old and I just now saw your comment via the automated Twitter retweet on my blog… Yes, I read David Allen (hence why I wrote this). These ARE indeed multiple systems – you're dead wrong about this being different collection points to the same system. Re-read the damn post. The point is to not try and contort everything into a monolithic storage mechanism for sake of adhering to orthodox GTD, I've seen too many people go overboard on trying to follow the letter of the practice vs. the spirit of the practice. The "system" is the collection of storage mechanisms you use each appropriate for the items it contains. I would issue this same advice to people who get wrapped around the axle trying to contort their biz practices cramming them into a monolithic ERP system vs. choosing best-of-breed apps that more closely match the need and knitting them together with Zapier- it's a fool's errand to do what you're proposing. BTW confident commenters will use a real name instead of taking pot shots behind an anonymous guest label. good luck with the snark though.